People who have visited Paris have all kinds of special memories from there. Seeing the Eiffel Tower lit up at night. Walking the Champs Elysées. Kissing along the Seine. Finding an amazing little bistro hidden in the 20th arrondissement. It’s a city filled with memories, just waiting to be made. One of my own all time favorite memories is a little different than most people’s. It’s my first visit to the Salon Saveurs des Plaisirs Gourmands, an exhibition of independent, artisanal food makers. Just imagine: a huge exhibition space, filled with hundreds of stands, each one a different, small producer of some of the most amazing food and drinks you’ll ever taste. From chocolates to breads, to cheeses and wines, to sausages and foie gras, to cakes and candies, to sauces and jams. The moment I walked into the space I almost passed out from excitement. Then, I started walking and sampling. I could write an entire book on everything I tasted during my three (yes, three) visits to the Salon. But one of them sticks to mind especially well. In a corner stand, a man and a woman were selling slices of pain d’épices, the traditional french spice cake that is sold in every patisserie and bakery in Paris. These were not your usual pain d’épices though. They were round and about a foot tall, the biggest ones I’ve ever seen. There were two or three different variations available but I first tasted a sample of the orange flavored one and my life changed forever. Ok, I’m exaggerating but my view of the pain d’épices definitely changed from that point on. This cake was light and moist with an intense flavor of honey and orange. The spices were definitely there but they were not too strong. Instead, they worked as a base or a background to let the honey and orange shine. I circled back to that stand a few more times to get more samples. It was, and still is, the best pain d’épices I have ever tasted. I’ve never been able to recreate it exactly on my own, even though I’ve tried several times. 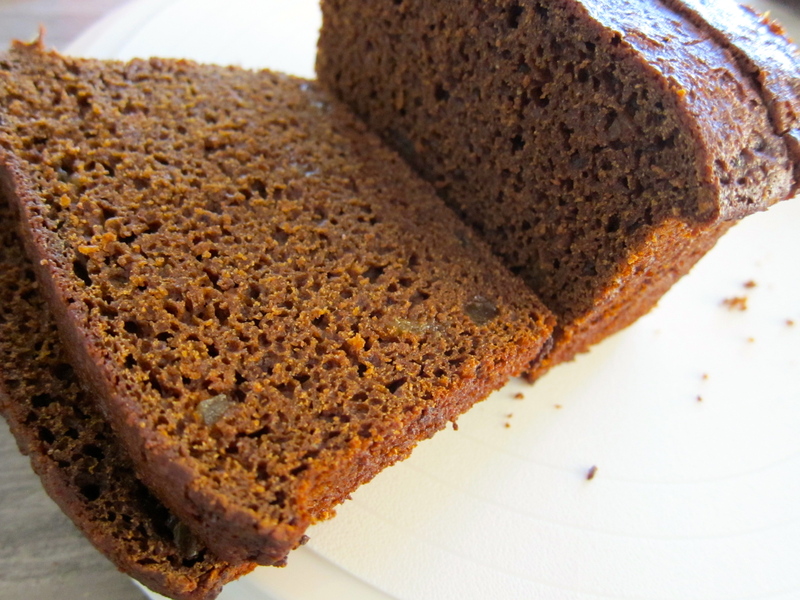 Different recipes have resulted in cakes that are either too dense, too dry, or too spicy. The closest I’ve come is with the recipe I have for you here. It’s by Clotilde Dusoulier, the brilliant mind behind the Chocolate & Zucchini blog, as well as a few cookbooks. 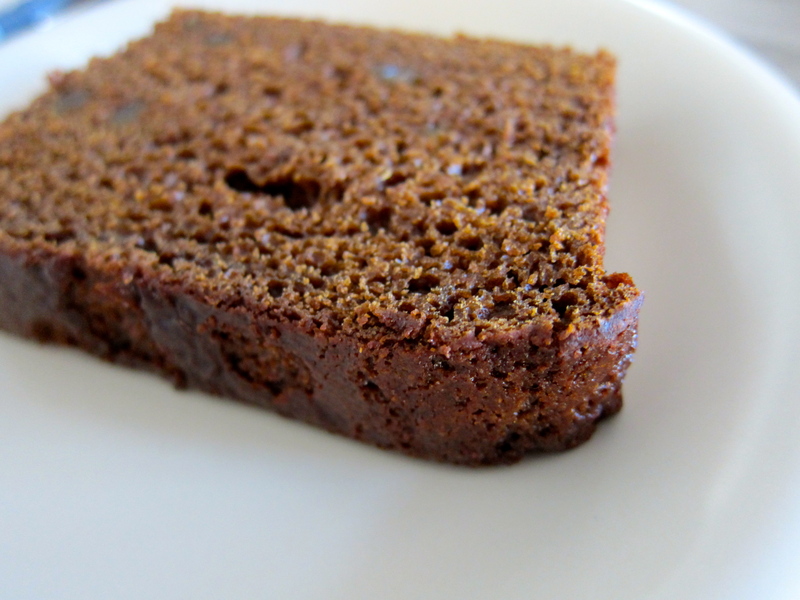 It’s an incredibly easy recipe to make and the cake it produces is moist and intensely flavorful. It also keeps very well for 3-4 days and even gets better in taste as it “ages” on the countertop. She proposes several variations in her book, such as one with chopped crystallized ginger (which is the one seen in these photographs), but our favorite is the one with orange rind and a tiny bit of orange extract. As an added bonus, the recipe can be easily made vegan by substituting the milk with coconut milk. I’ve made both versions and we’ve never been able to taste the difference. Preheat the oven to 350° F. Grease a 9 by 5-inch loaf pan with about a tablespoon of vegetable oil. 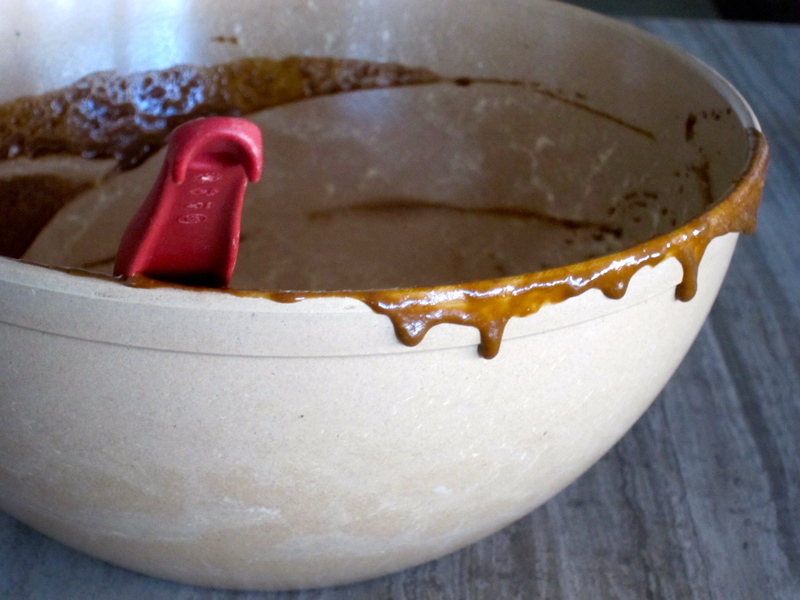 Line the bottom of the pan with parchment paper. 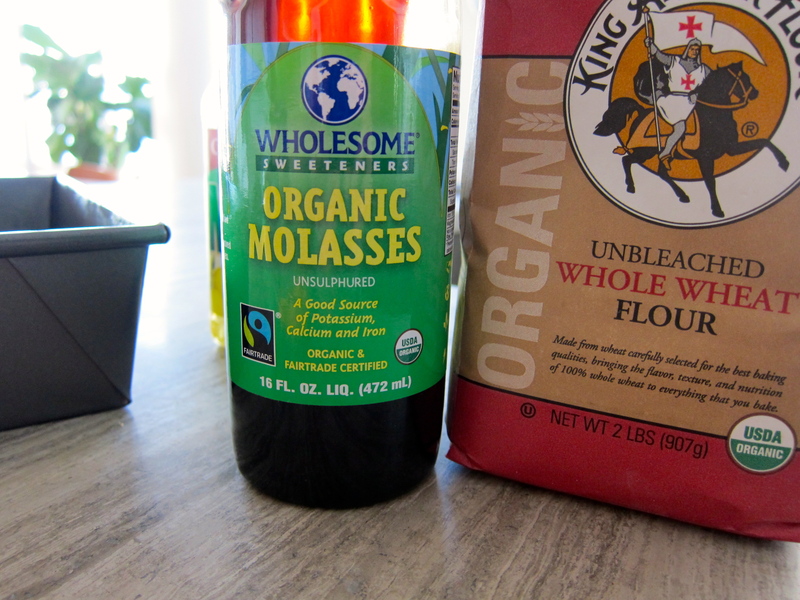 In a small saucepan, combine the milk, honey, and molasses. 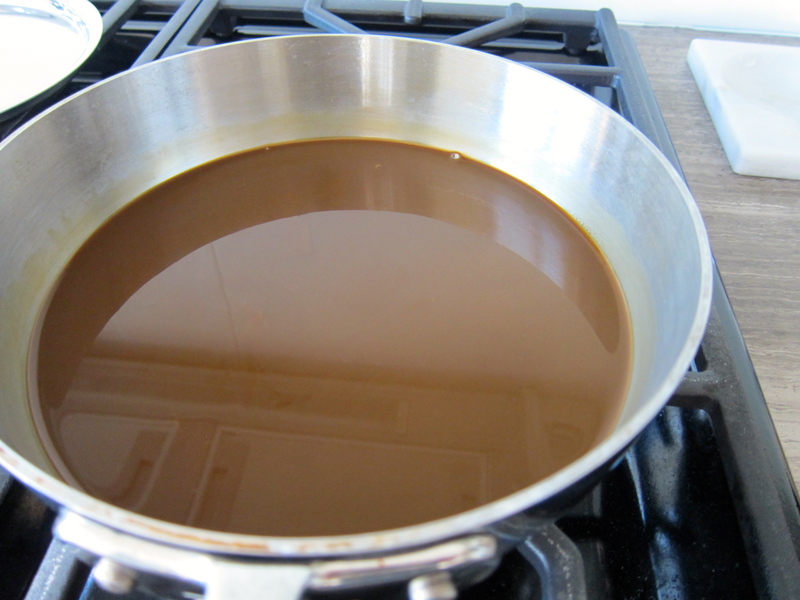 Stir over medium heat until the honey and molasses have completely dissolved. Remove from heat and add the orange extract, if using. Set aside as you continue with the recipe. 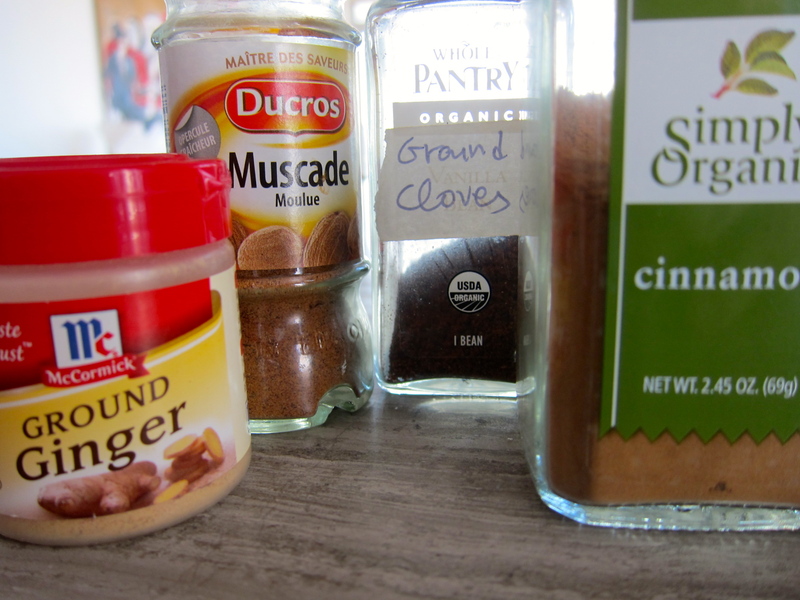 In a large bowl, whisk together the flours, baking powder, baking soda, salt, spices, and orange zest. Form a well in the center of the flour mixture and slowly pour the milk mixture in while whisking from the center out, in a circular motion. Whisk until all the flour has been incorporated. The batter will be thin. Pour the batter in the prepared loaf pan and bake for 40-50 minutes, or until a knife inserted in the center comes out clean. Transfer the pan to a rack and let it cool for 20 minutes. Run a knife along the sides of the pan and unmold the cake. Cool completely on the rack and store at room temperature wrapped in foil or in a cake saver.